I decided to reduce my category tree using subheadings tool. I wonder if it is possible to add an option "turn category into subheading" to the Knowledge Organizer. 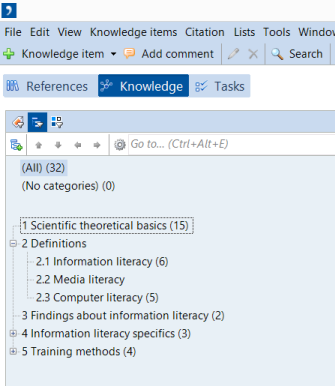 -when Ctrl+X a quote in Knowledge item it automatically disconnects the quote from its reference, therefore you can not Ctr+X Ctrl+V quotes from multiple references selecting all of them and moving from one category to another while you have to apply all of them to one chosen reference (still you can move it by dragging but there is another problem described below). -when you move quotes with their subheading to another category quotes can disappear from the subheading when they already exist in the category where you moved them. The problem is it is hard to find which quote disappeared (no information), and moreover the subheading is probably better place for moved quote than the category in general. Thanks for your feature requests, and please excuse the slow response! I'll add your request to our wish list for new features. Please keep in mind, though, that subheadings aren't designed to be as robust as categories and subcategories. They're just a way to organize the items within a particular category or subcategory for better viewing within your Citavi project. Subheadings are not linked in any way with knowledge items the way a category, keyword, or group is. With the most recent beta version, I couldn't reproduce the problem that subheadings were lost after dragging them and their knowledge items to a new category. Could you please test this again with the next beta version and let us know if the problem is still occurring then? Once the next beta version is available, you'll see a notification in the "News" section of the Citavi Welcome Screen. It is too late - I did this mistake two days ago (It took me half a day to convert subcategories to subheadings) and now I am dreaming of searchable subheadings. I think I'll use my back-up file to go back these days. On the other hand the Categories tree looks much better now. In my opinion subheadings should work as "invisible" subcategories. What I very not like is that higher category is not previewing quotes from its subcategories (like subheadings). I'm sorry that you now have additional work! I'll add your suggestion for expanding the functionality of subheadings to our wish list, but we very likely won't make this change since the subheadings are meant more as a visual organization tool. Also, a redesign of this feature to make it work more like categories would be technically complex and we have not seen much of a need from other users for a redesign. I actually think it would be great to have the preview of all quotes in the category and its subcategories. I see subheadings they appear between quotes (exactly where subcategories are) after selecting main category. Hide/Show Subheadings (so visually you can clean categories when necessary). Subheadings should be searchable I think. Master Project View (this I think is great idea, concurrent to clone categories etc.!). When you work on your Project you can import virtually categories from the Master Project. Every thing you change in the Project is added to the Master Project and opposite. So your all knowledge can be built in the Master Project but you can select particular categories (with all their subcategories included virtually) to be virtually previewed in your Project you are currently working on. Thanks for the additional explanation and the suggestion for a master project view, which I'll add to our wish list. Again, it's unfortunately probably going to be a while before we are able to make any major changes to the Knowledge Organizer since our main focus right now is Citavi Web. We really appreciate your input and ideas, though! Thanks again for putting so much thought into your suggestions! I came back to Citavi after long pause and the first impression of putting the quote from PDF was that in the quote window in the category box I could only choose categories, not subheadings. I know I mentioned it before but it seems to me that it will be quite useful. I believe the best will be the second choice after choosing category to choose or to add new subheading. Subheadings are much better than building too big branch of categories. 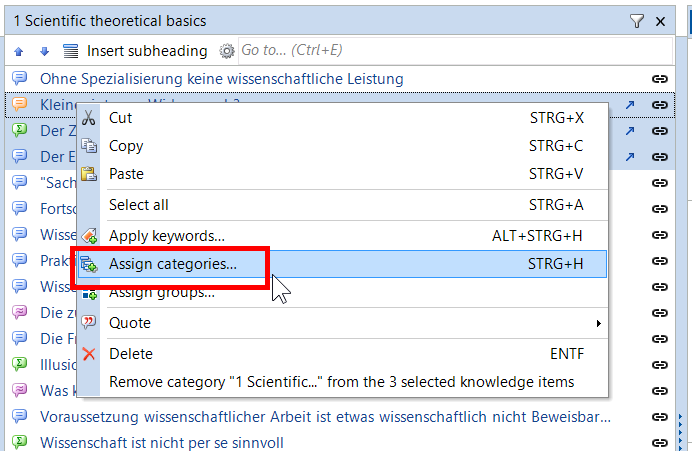 Managing subheadings in the Knowledge pane is not comfortable when reading PDF in Citavi. Thank you for coming back to this issue. As subheadings are only a visual tool, they are not linked to quotations you save from a PDF document. Subheadings are rather a tool to help you structure a large collection of quotations within a certain category at the end of your work. If you plan to add further quotations to a category, please use subcategories to create a deeper structure.